Ise Kadoya Platinum Dragon is a 4% session pale ale (great, the dreaded word session has come back to haunt us) from Ise Kadoya, based in Mie, Japan. It’s part of their limited edition range of beers that the president of Ise Kadoya help to design, and as such, it’s unknown whether Ise Kadoya Platinum Dragon will come out on sale again. Ise Kadoya Platinum Dragon uses the Ise Kadoya Golden Dragon as its base and has been made “sharp” – whatever that means? Session – the latest buzzword in a series of unnecessary additions to names – should have been the word of the year, rather than “北” or north. Why Ise Kadoya decided to put it on a 4% pale ale ale is beyond me. I wonder if 2018 will see “light session”™ beers come into fashion? Ise Kadoya Platinum Dragon poured out an orangey yellow colour with a fair amount of fluffy white head that faded fast into obscurity. Which is kind of apt as that’s exactly what happened to the aroma. It was a citrusy orange aroma that didn’t linger long before a buttery nose came rushing forward. There was a meagre amount of biscuity malt aroma also coming through but it was fleeting. The body to Ise Kadoya Platinum Dragon was not so much light but more thin – the flavours didn’t really stand out too much but I guess that’s the sharp part. There was a quick lemon orange flavour to it that came and went before I had a chance to really register it. The malts were lacking and didn’t really stand out too much either. The bitterness to Ise Kadoya Platinum Dragon was quite light with the lemon flavour adding some sharpness to it all. 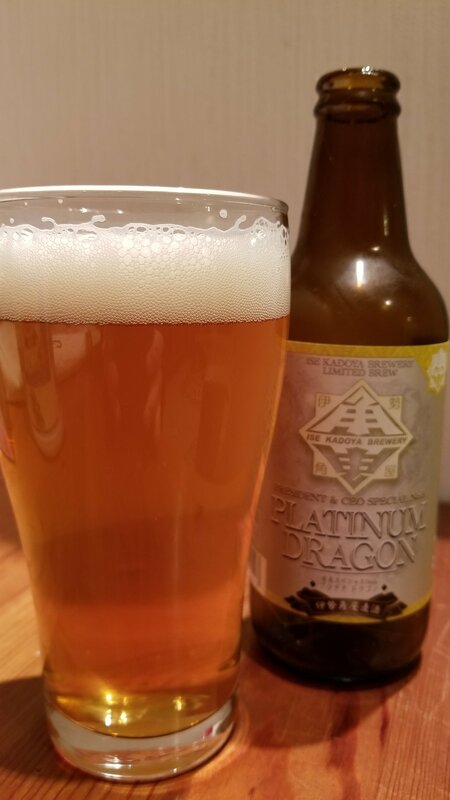 Maybe the president of Ise Kadoya should stick to running the company and let the brewers come up with the ideas to the beers if Ise Kadoya Platinum Dragon is anything to go by.